A federal judge ruled in favor of Robert Mueller on Wednesday that Paul Manafort intentionally violated the terms of his guilty plea by lying to federal prosecutors and a grand jury, clearing the way for the special counsel to push for a harsher sentence. The decision by U.S. District Court Judge Amy Berman Jackson confirms some of Mueller’s latest set of charges against the former Donald Trump campaign chairman that he lied during guilty-plea-stipulated cooperation sessions about his contacts with Konstantin Kilimnik, a longtime aide alleged to have ties to Russian intelligence. But Jackson, an appointee of President Barack Obama, didn’t side with Mueller on all of the alleged lies the special counsel asserted. For one, she ruled that Mueller had “failed to establish by a preponderance of the evidence” that Manafort intentionally made a false statement about his contacts with the Trump administration. Despite the split opinion, the judge’s four-page ruling against Manafort means the 69-year-old political operative will likely get an even stiffer penalty at his March 13 sentencing hearing in D.C. federal court. She said Mueller’s office was “no longer bound by its obligations under the plea agreement” terms he’d reached with Manafort in September, including the special counsel’s pledge to recommend a less-stringent sentence. Even with the plea deal voided, Jackson can give Manafort a maximum of only 10 years on the two charges he pleaded guilty to in Washington — conspiracy against the U.S. and conspiracy to obstruct justice — in exchange for Mueller’s dropping foreign-lobbying and money-laundering charges. The plea agreement had also called for Mueller’s recommendation that Manafort serve his time concurrently from his D.C. case with any sentence he gets from his convictions in Alexandria, Va., on charges of bank and tax fraud. But with Jackson’s order on Wednesday, Mueller is now free to suggest that Manafort serve his sentences consecutively. Both Jackson and U.S. District Court Judge T.S. 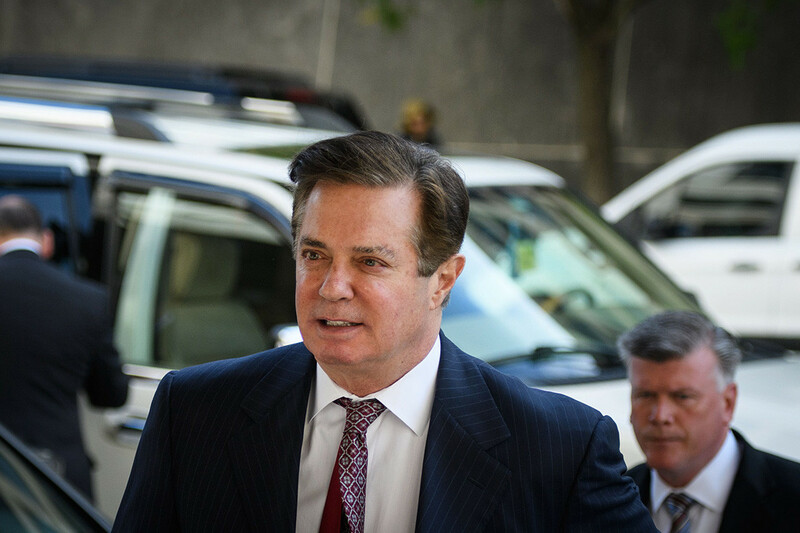 Ellis III, who presided in Manafort’s trial in Virginia and had postponed sentencing until the dispute over the lying charges was resolved, will have the final say in the decision on whether he serves back-to-back or concurrent sentences. While Manafort faces the theoretical possibility of up to 80 years in the Alexandria case and 10 years in the D.C. one, federal judges typically sentence defendants in accordance with sentencing guidelines that usually call for terms well short of the maximum. Legal experts have said the guidelines in the Virginia case are likely to call for seven to 10 years for Manafort in that case. Judges are required to calculate the guidelines applicable in each case, but can give a sentence outside that range if they believe it’s appropriate. Spokesmen for Manafort and Mueller’s office declined to comment on Jackson’s order, which she made public hours after holding her second closed-door hearing on the dispute. Mueller’s team in December accused Manafort of making misstatements in five different areas during his cooperation with the special counsel, including his contacts with the Trump administration and Kilimnik, a Russian-Ukrainian national and longtime associate whom the special counsel has also charged with witness tampering. In response, Manafort’s attorneys argued that his misstatements were not intentional but were instead the result of poor preparation and declining physical and mental health tied to being kept in solitary confinement since last summer. “Mr. Manafort did not lie,” the longtime Republican operative’s lawyers argued in a redacted 13-page court filing on Wednesday claiming that Mueller’s prosecutors hadn’t backed up their assertions that Manafort intentionally misled them. In her ruling on Wednesday, Jackson said Mueller’s office “made its determination that the defendant made false statements and thereby breached the plea agreement in good faith.” But drilling down to the specific allegations, she said Mueller had “established by a preponderance of the evidence” its case on three of the five underlying areas. Mueller’s team convinced Jackson that Manafort made false statements about a $125,000 payment he made toward a debt he’d incurred to a firm working for Manafort in 2017. It also demonstrated that Manafort made multiple false statements about his interactions and communications with Kilimnik, as well as his false statements material to another unspecified Justice Department investigation. Jackson, however, rejected Mueller’s new charges that Manafort was intentionally misleading in his false statements about Kilimnik’s role in an obstruction of justice conspiracy, as well as his contacts with the Trump administration. The dispute over Manafort’s cooperation ended up offering several unexpected glimpses into Mueller’s 20-month-old Russia investigation. Last month, Manafort’s lawyers inadvertently revealed in a court filing that their client shared polling data on Trump’s 2016 campaign with Kilimnik. They also disclosed that Manafort had exchanged text messages with an unidentified person looking for an introduction to Trump. Both items were made public because of a redaction error. Deputy special counsel Andrew Weissman, meanwhile, told Jackson last week that Manafort’s interaction with Kilimnik goes “very much to the heart” of Mueller’s broader mandate to examine Russian influence on the 2016 campaign. That comment came in a hearing transcript released to the public. While redactions in the document and related court filings make it challenging to get a full reading of the dispute between Mueller and Manafort, the special counsel appeared focused on efforts during and after the last presidential election to get the U.S. government to consider a peace plan aimed at resolving Russia’s annexation of Ukrainian territory. Mueller’s office has said that Manafort and Kilimnik — someone the FBI said had a relationship with Russian intelligence — discussed the Ukraine peace plan numerous times. The talks, Mueller’s team claimed, occurred in August and December 2016, in January 2017 when Kilimnik was in Washington for the Trump inauguration, again in February 2017 and even in the winter of 2018. During last week’s hearing, Weissmann said the special counsel’s office in particular questioned the veracity of Manafort’s statements about a meeting with Kilimnik on Aug. 2, 2016, at the Grand Havana Club in New York. “There is no evidence to support the [office of special counsel’s] speculation that Mr. Manafort had a secret ‘plan’ from the outset to hide subsequent meetings with Mr. Kilimnik,” Manafort’s lawyers added. Mueller’s allegations also appear to focus on the GOP operative’s acknowledgment that he continued to do work for a potential Ukrainian political candidate into 2018. The transcript released last week deletes the name of the candidate, but the special counsel’s prosecutors described a draft poll prepared with Kilimnik and questions that seemed intended to go beyond their campaign to look at broader policy issues. The prosecutors appeared to suggest that the poll stands as evidence that Manafort’s work on the Ukraine peace plan didn’t stop after he was indicted in late 2017. “Even if there was any relevance or materiality to this issue given that, at this point, Mr. Manafort has no ties to the presidential campaign or the new administration, the government’s assertion (and thus its theory) is based on semantics,” the Manafort lawyers argued.